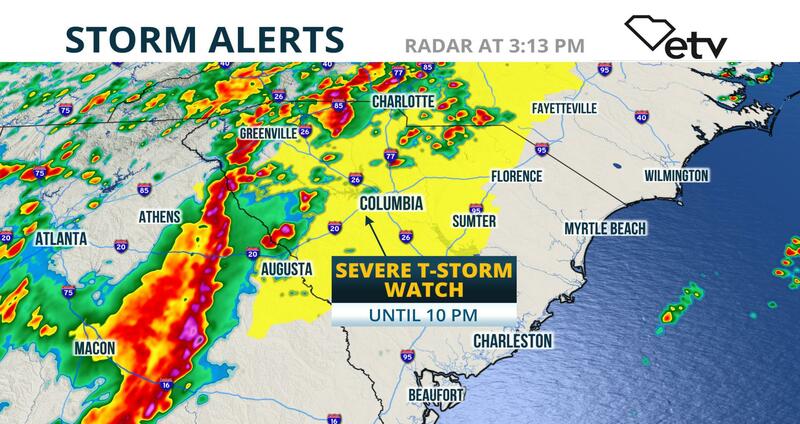 A Severe Thunderstorm Watch has been issued for most of central and northern parts of South Carolina until 10 pm. At 3 pm, a line of strong thunderstorms was seen organizing on radar from just east of Anderson, SC to about 30 miles west of Augusta, GA. Several other thunderstorms were developing ahead of this main line and moving to the northeast at 30 to 40 mph. The strongest storms will be capable of producing damaging wind, hail, and even an isolated tornado as they move across the Upstate of South Carolina and the Midlands through early evening. 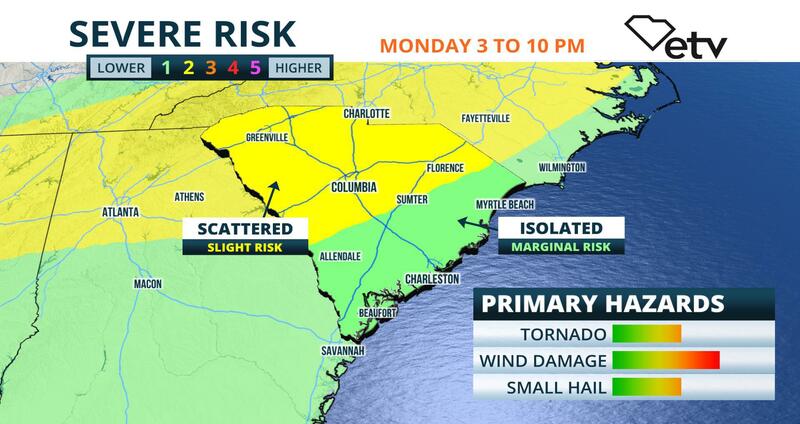 Damaging wind gusts, hail, and even an isolated tornado are possible across the Midlands, Pee Dee and Upstate regions of South Carolina Monday afternoon. Strong thunderstorms are also possible across the low country this evening. A complex of strong thunderstorms is expected to cross the Georgia-South Carolina border between 3 and 4 pm. A warm and unstable air mass is already present ahead of the storms, and this combined with strong upper-level winds will aid in the strengthening of some cells that could prompt warnings for possible damage. The storms are expected to weaken below severe levels late this evening, but scattered showers and thunderstorms will still be possible in some regions of the state overnight. Another round of strong thunderstorms are possible across the southeastern half of the state Tuesday, before a cold front brings more stable air into the region midweek.